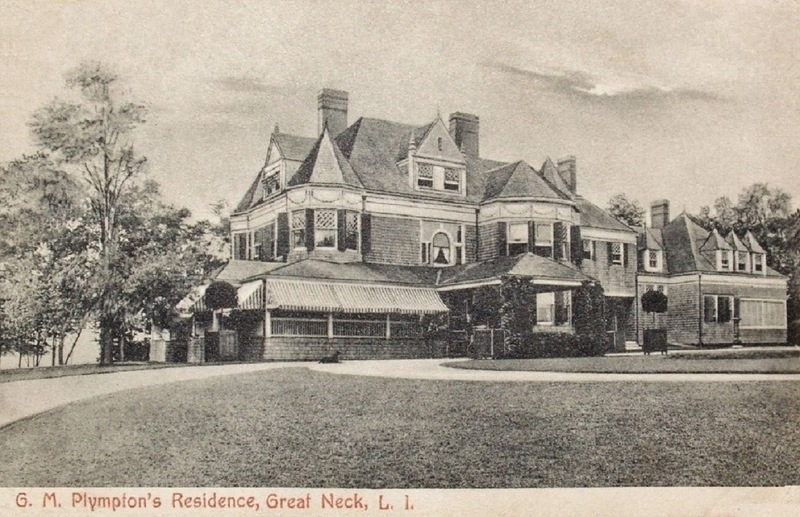 'Edgewater', the George H. Holt residence built c. 1898 in Great Neck pictured under the subsequent ownership of Gilbert Motier Plympton who purchased the home in 1903 and renamed it 'Wyndtryst'. Plympton began his career as a lawyer and was a member of the banking firm of Plympton, Gardiner & Co. 'Wyndtryst', which abutted the Sound, was robbed by "pirates" according to a 1907 NYTimes article that says they made off with $2,500 in silverware. Plympton would go on to sell the house to Sherwood Aldrich, president of the Ray Consolidated Copper Company, in 1916. Aldrich was building a new house by Walker & Gillette next door and bought the Plympton property to incorporate into his. 'Wyndtryst' has since been demolished. If this wonderful house were still standing, and for sale, the real estate agents would have it listed as "Attributed to McKim, Mead & White" ~ no doubt. And everyone would go gaga over it ! Did anyone notice the reclining dog in the driveway, in front of the enclosed porch ? Nice looking house. Even if the burglars entered the property from the water I think it's a stretch to label them pirates -- unless they ransacked the house while yelling, "Arrrrhh" & "Avast, ye matey!" In addition to the dog resting in the drive there is a horse & carriage in the porte cochere. You have sharp eyes Doug ! I might have noticed that if I hadn't have had those tee Martoonies beforehand !